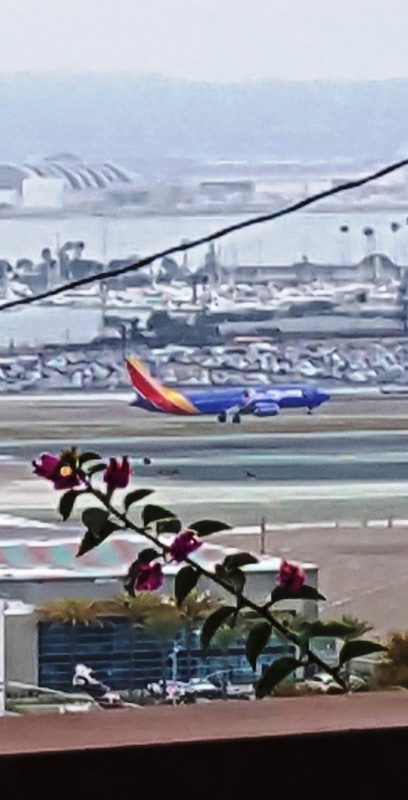 HAZY MORNING, HAZY PHOTO…BUT VISITS TO SCOTT IN SAN DIEGO MUST BEGIN WITH A VIEW OF A SW AIRLINES LANDING FROM HIS WINDOW. MAYBE I’LL DO BETTER IN THE NEXT DAY OR TWO. OR NOT. This is my first foray out into the wide world after returning in an exhausted skinny bronchial-plagued heap from India at the end of November 2017. The entire SE Asia/India adventure was stupendous (sorry for the superlative–they sound rather Sleazy-T like these days), one of my best journeys ever, but it was also about as demanding as little old ladies in tennis shoes can take on… I hope switching to California, South Dakota and Norway for a rest year is permissible before tackling the Silk Route. About travel skills. First of all, eating and drinking carefully. And/or getting the right drugs to make my stomach behave so my diet doesn’t consist of protein bars, crackers and Nescafe in a water bottle. Went to my arthritis doc yesterday and he gave me a new stomach-soothing prescription to try out. Took one. We then went to Shakespeare’s pub near Scott’s house at 6pm, and I had a bitter beer and small serving of bangers and mash (beginning of my British-themed pre-wedding prep), I did NOT go to a gym, I slept about ten hours…and this morning I feel in perfect health. This is after doing everything—food, gym—right the day before yesterday and being sick all day yesterday. So there, healthy living! It’s all about beer and mashed potatoes. It’s 7:20 am Cal-time. Family all at work already. Healthcare, drug-testing, marketing businesses. Not a poet nor beach bum among them—so what’s the use of living in California—other than it being the natural habitat of liberal Democrats. I’m practicing blogging in bed which I’ve not done since that smog-blocked room in Delhi. Okay, good, still know how to do this. I might be bored. No work. No agonizing about my unwritten book (all my notes and thoughts stayed in New Mexico). Nothing to clean or water. No errands to run or groceries to buy. Need a break from the book I’m reading and tried Scott’s new Nesbo, only to confirm that Nesbo is the most overrated mystery/detective writer on the planet. Perhaps I’ll post something a bit more engaging after being out and about this afternoon. Let’s see…Nordstrom’s, a pot store, Russian food, and a walk on the beach. Which can all be only approximated in Albuquerque. Yay for travel. SANDRA IS THE ONLY FAMILY MEMBER CARRYING ON MY MOM’S TRADITION OF BEING A RESPONSIBLE CHRISTIAN. STEVE, MY GRANDSON, HAS LOANED ME HIS BEDROOM. HE’S STAYING HERE NEAR HIS JOB WHILE SAVING MONEY FOR THE WEDDING OF THE CENTURY, FALL 2019. BIGGER AND BETTER THAN HARRY AND MEGAN’S…WITH FILIPINO, ARABIC, CHINESE AND NORWEGIAN TRADITIONS TO BE INCLUDED. A marvelous time of year to be here. Happy Mother’s Day.